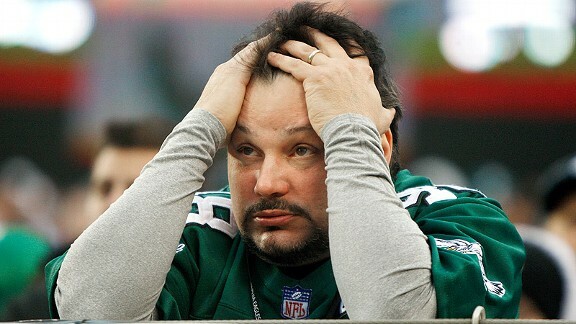 Rich Schultz /Getty Images A Philadelphia Eagles fan shows his frustration after Sunday's loss to the Arizona Cardinals. Yes, the Philadelphia Eagles lost 21-17 to the Arizona Cardinals on Sunday. The season is all but over for the "Dream Team." And naturally, the city with an outlook almost Always Not Sunny isn't happy. But booing? That's so 20th century. Even in Philly. That's Jim Cramer, suburban-Philly native and "Mad Money" man, who took to Twitter shortly after his Eagles lost to the previously struggling Skelton Crew. That was Questo, drummer for the Grammy-winning, Jimmy Fallon-backing hip-hop/soul band The Roots. Yes, even WWE divas were distraught. And those were just the celebrities. Thousands of Everyfans tweeted anti-Eagles sentiment well into the week -- spending the ensuing days linking to local news stories, sending out their own angry blog posts, sharing Twitpics, or just generally reminiscing about the Good Ol' Eagles Days of yore (2010). Then there was Facebook, namely the Philadelphia Eagles' official fan page -- followed by nearly 1.5 million people. We use the term "like" loosely. Because said official page allowed criticism to fly like an -- well, you know -- posting a struggles-based poll question and featuring fans' cries of "Need new management!" and "thanks for nothing" and "Season: Over" and "Fire Juan, Fire Andy, Fire Marty, and we got a football team!!" Declared one: "Andy's been saying he has to do a better job for 10 seasons! I'm tired of waiting!!" Other impatients took to Reddit, a social news site with its own (profanity-friendly) Eagles fan section/message board. There, fans floated ideas for their next coach, asked others for a playoff-bound team to cheer on, offered an alternative to Eagles Sundays (in short: play Madden) and mused ironically about the team's dire situation. From YaksAreCool: "In other news, David Akers is having a pretty good game right now." And lolspoilers: "On the bright side ... at least I'm not going to have to spend any cash on airfare/playoff tickets." Others were a little more heated -- none so much as a 10-minute clip that's just blown up on the Web this week. It's wayyyy too NSFW to link. But it's out there, and the star makes Angry Greg look ready to declare Philly Super Bowl-bound. Yes, that's what a loss in 2011 looks and sounds like. Patrick Dorsey is a Page 2 editor. He can be reached at bypatrickdorsey@gmail.com.